Perfect for any outside sitting area, these Recycled Plastic Mats are comfy and environmentally friendly! 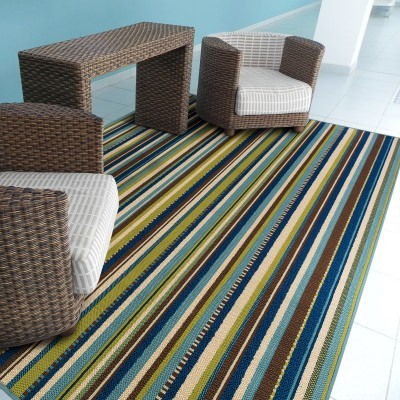 Smooth and Durable, these Flat Weave Rugs can add that extra little accent to your outdoor sitting area. Few things can beat the quality and comfort of a good old Handmade Rug. 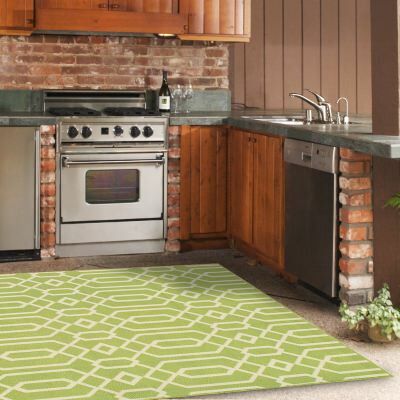 Durability and Strength come to mind when talking about these Machine Made Outdoor Rugs. 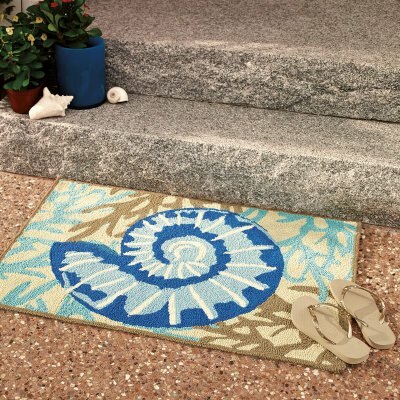 The perfect addition to your outdoor rug if you need a little extra cushion underfoot. 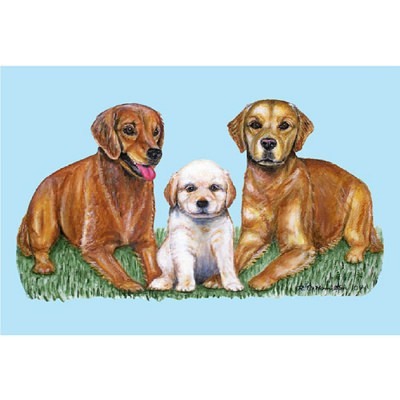 Welcome your guests properly and in style with our outdoor door mats. Take a look through all of our Outdoor Rugs, with such a wide variety your sure to find a keeper! 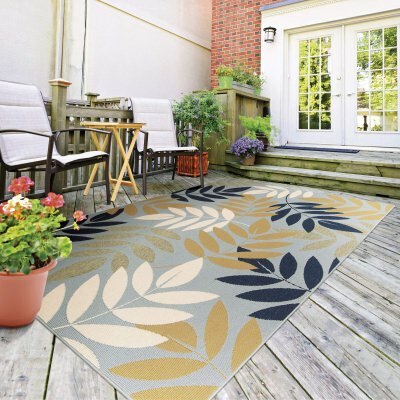 Classic and calm, these Black Outdoor Rugs make a very attractive accompaniment to any deck or patio. 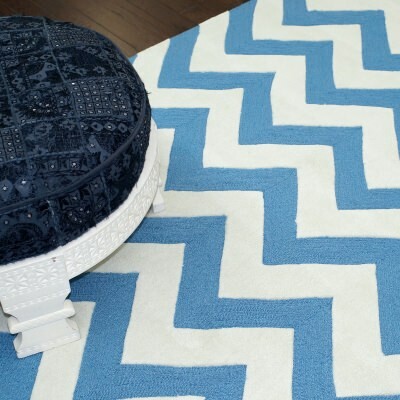 Cool and Collected, few things can make the statement that these classy Blue Outdoor Rugs can. 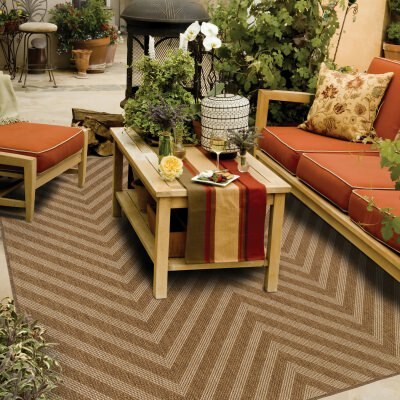 With an earthy and natural Brown Outdoor Rug, options abound in how to setup your outdoor space. Gray Outdoor Rugs can really bring the space together, regardless of it being indoors or outdoors. The Green Color of these Outdoor Rugs can bring a hint of nature to your space, even if there's not a tree in sight! These Orange Outdoor Rugs are bright and cheery to add some levity and lightheartedness to your space. The Pink and Purple Colors of these Outdoor Rugs can add some personality and life to a plain sitting area. 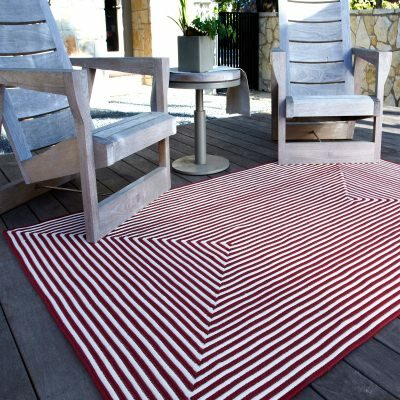 With plenty of designs and patterns, these Red Outdoor Rugs add versatility and accent to your deck or patio. With Natural colors and tones, these Outdoor Rugs can help to build a calming and relaxing atmosphere in your sitting space. Quirky and unique, these Multi Colored Outdoor Rugs can add a great conversation piece to your deck or patio. 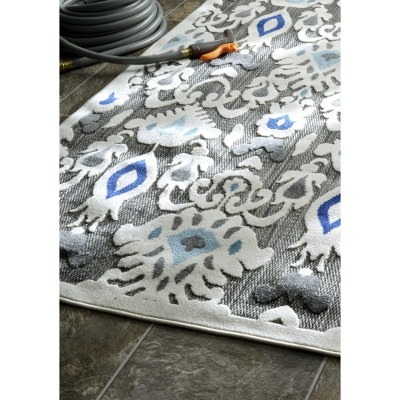 These Door Mats can add an excellent accent to your entryway or foyer. 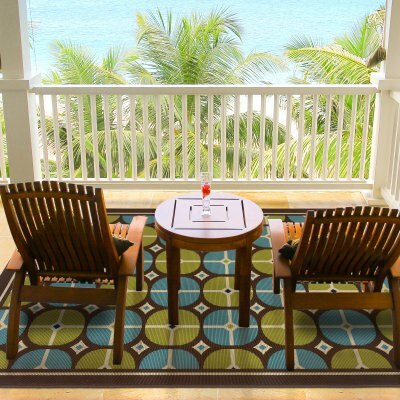 The classic Rectangle area rug is perfect for those outdoor sitting areas. 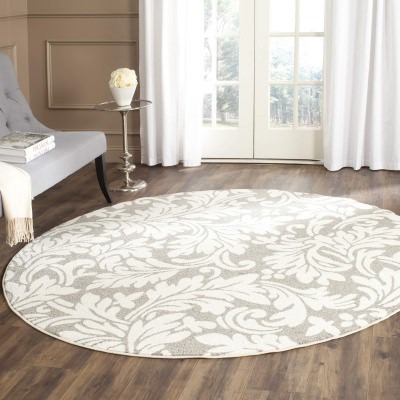 Wonderful for the outdoors, these Round Rugs make a great gathering for your social events. Square Outdoor Rugs can add a little bit of order to a chaotic patio landscape. Perfect for those long outdoor pathways, these Runners can add a little personality. The chevron pattern is distinctive and fashion-forward. Wow your guests! 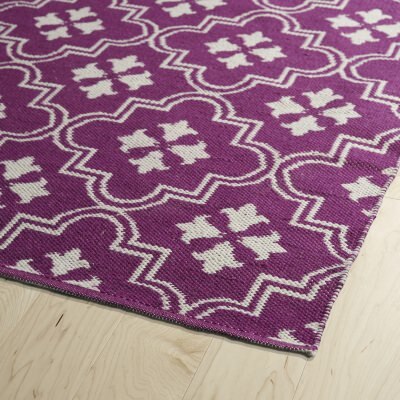 These attractive Ikat Rugs owe their style and appearance to the unique method of dyeing used to color these gorgeous rugs. 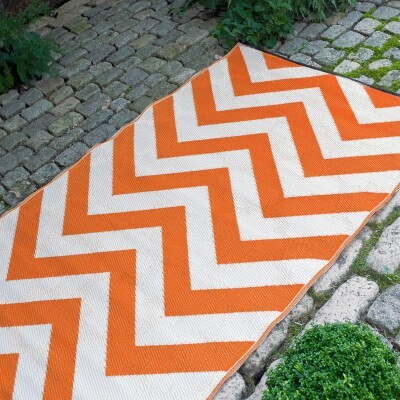 These Chevron styled Outdoor Rugs can add a bit more form and line to your outdoor space for that extra "oomph" of variety. These Bordered Outdoor Rugs can add a unique accent wherever you decide to place it. Solid Colored Outdoor Rugs are an excellent addition to any outdoor space. 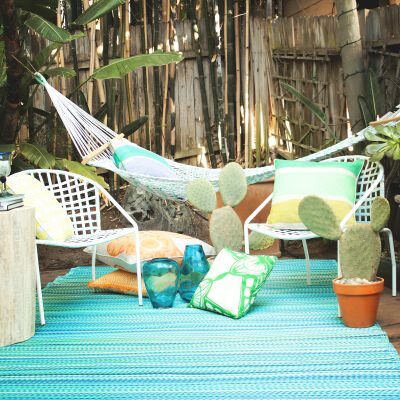 Few things can compete with the addition of a Striped Outdoor Rugs. 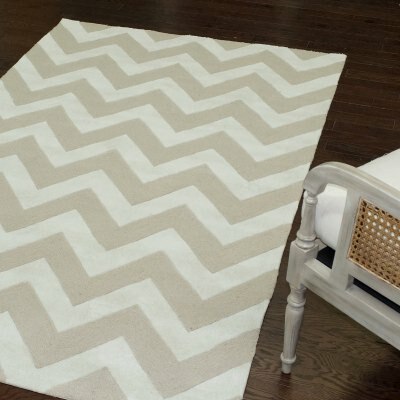 Adding a definitive look and feel to your space, these Patterned Rugs are excellent in any locale. 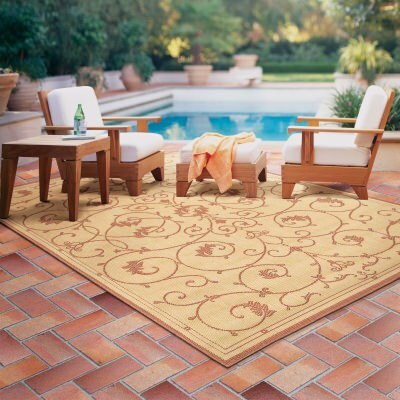 Classic and attractive styling is one way to describe these Traditional Outdoor Rugs. A wonderful addition if your space needs a hint of nature or your garden space needs an accent. These Seasonally themed Outdoor Rugs are the perfect addition for your patio or deck. These Outdoor Rugs by Liora Manne give you options to spruce up your outdoor space with a little personality. We’ve been in the outdoor rug business since 2002. In that time, DFOhome.com has assembled of the finest products on the market. 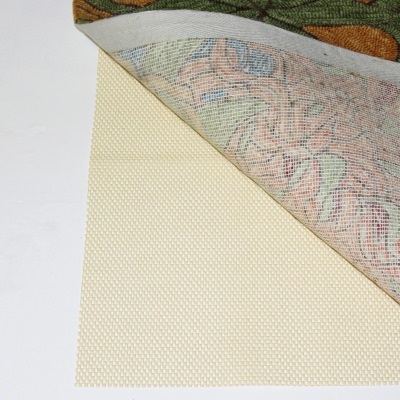 For an exposed outdoor space, try our waterproof, eco-friendly Mad Mats. 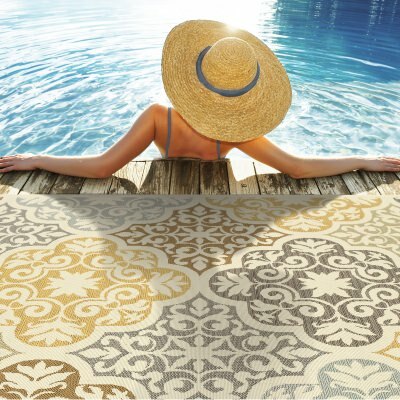 If looking for patio rugs over a covered area, check out Couristan and TransOcean’s beautiful line of quick-drying outdoor rugs. We’ve got rug designs from all over the world – you’re sure to find a rug that caters to your outdoor decorating needs! 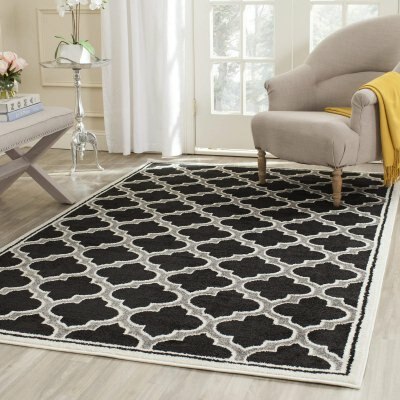 Looking for a rug to go on an uncovered patio or deck? Try a recycled plastic mat. They're extremely mildew resistant and effortlessly wick away moisture. Looking for something soft with a more traditional feel? Handmade outdoor rugs have a thicker pile that's extra kind and gentle to your feet. 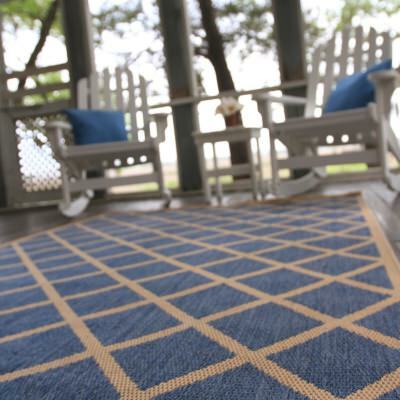 For the best of both worlds, consider our collection of machine made outdoor rugs. 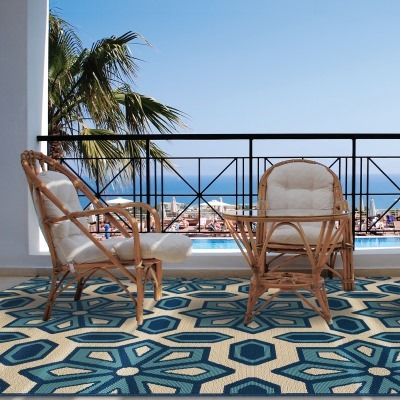 They're woven from finer polypropylene threads, giving them the feel of a traditional rug, but with a smaller pile height that promotes great performance in even in wet conditions. Creating outdoor living rooms is the latest trend in home improvement. 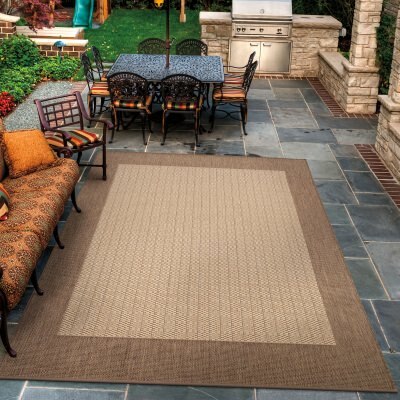 Making cohesive outdoor rooms is easy with the right outdoor area rug to define your space. You can use one to anchor a seating area, go under an outdoor table or place one out in the yard for a cozy spot to lounge or for the kids to play on. To complete your space we also carry outdoor throw pillows, cube seats and accessories all made for the outdoors so they are durable, weather-resistant and ready for long-lasting enjoyment in you outdoor living room. 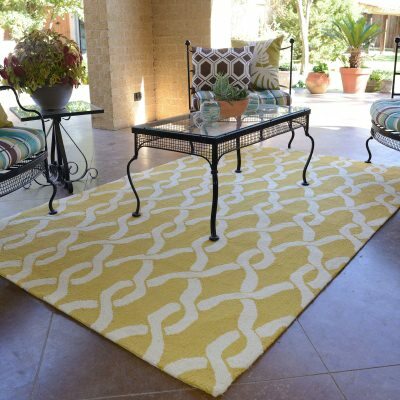 The popular colors for outdoor rugs this year will be warm colors and earth tones. Expect to see fire-inspired reds, ocean inspired blues, golden browns and greens. 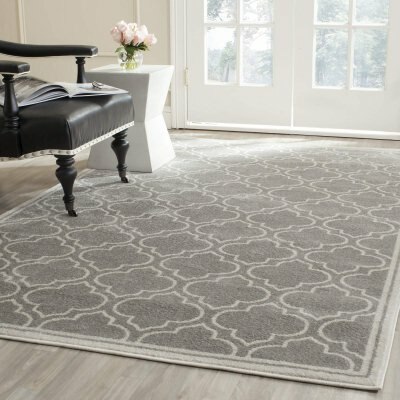 Also making its debut this year in the outdoor rug market is gray. Use colors to make your outdoor spaces warm and welcoming, while still remaining contemporary and calm. Mixing patterns and different colors in the same room or space is in for 2011. Be bold and combine dark colored, busy patterns with lighter colored, less busy patterned items. For those less adventurous, safer designers, many rug brands offer the same colored rugs in an array of patterns. Mix and match patterns while staying in the same color palette. 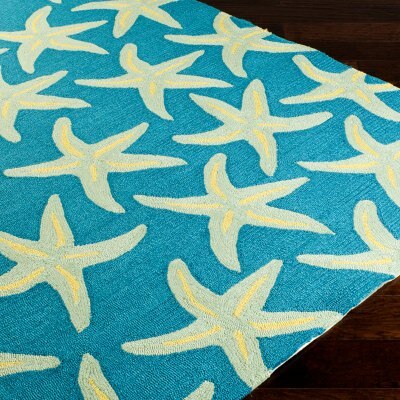 Check out Couristan and TransOcean for an assortment of these great kinds of rugs. 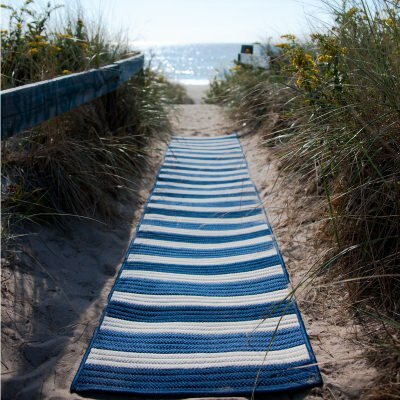 Luxury is always in and we carry an assortment of gorgeous handmade outdoor rugs at low prices. Handmade outdoor rugs have a special attention to detail and come in a larger assortment of colors than machine-made. Each rug is hand-hooked so it is one of a kind and due to its heirloom-quality these rugs will be a long-term investment. Hand-made brands include TransOcean, Surya, Jellybean, and The Rug Market. 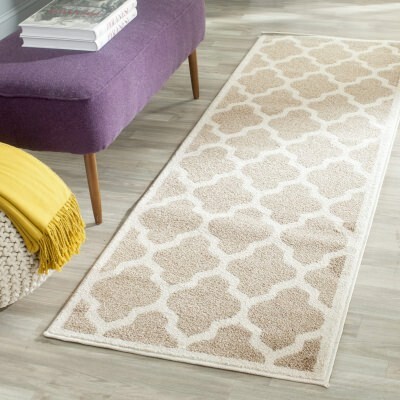 Along with already low prices, all our rugs come with free shipping giving you luxury at the lowest price.